This is a great time for variety. Combined trips for speckled trout and redfish are achieving excellent results. With the correct approach, great catches of both species are a reality now. The best anglers use the lightest tackle. Light rods and reels, light leader line and even light lures. The choices in lures: longer jerkbait plastic tails for trout and 3-inch paddle tail plastic tails for redfish. Rig these tails on ?-ounce jigheads. The time of day doesn’t matter as much as it did when it was still “summer.” The location will dictate success. You will catch the biggest trout in the same location as the redfish. The redfish will be located in depths of less than 2 feet. “Numbers” of trout will be in 3-foot depths or more with thick seagrass on the bottom. Getting strikes from trout are easy. They are very cooperative but for the best results, keep the lure right near the bottom. With redfish in shallower water you need to be more aggressive with the lure, but the same rule applies: Success has everything to do with swimming that paddle tail down near the bottom. Speckled trout will set the hook on their own. 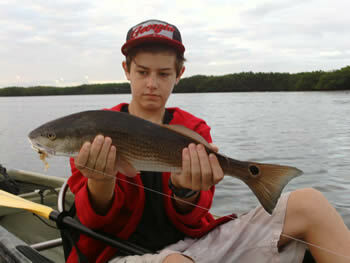 With redfish you want to do a hook-set on the strike to drive the hook point home.